Former Vice President Atiku Abubakar has expressed joy and relief at the release of human rights lawyer, Chief Mike Ozekhome, by his abductors. In a statement by his media office in Abuja, the former Vice President said he was full of joy that the kidnap saga came to an end. 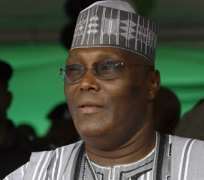 Atiku also congratulated the family of the lawyer and the Nigerian Bar Association on the resolution of Ozekhome's ordeal at the hands of his captors. Meanwhile, the former Vice President offered his prayer for the quick release of Archbishop of the Ecclesiastical Province of the Niger Delta, the Most Rev. Ignatius Katteh. The former Vice President also calls for prayers for all victims of kidnapping currently in captivity across the country. He called on Nigerian police and security forces to intensify their focus nationwide on protecting our families and preventing violence.